It’s an area I know well, not far from where I live, but its topography is not anything I’d really ever thought about before. For a few months I even worked in the area, translating dull technical documents in the small basement office of a 1970s apartment block. I wandered around at lunchtimes, and walked to and from the office every day, but the Canal Saint-Martin and Basin de la Villette were close by, and they took most of my attention. The bridges Jonathan mentions are both striking, and the surrounding area is indeed something of a game of Mikado in an otherwise precise and linear city, but until now I never thought about why it should be this way. I’m not sure it’s ever possible to decipher the full logic of urban evolutions, but I hope I can help Jonathan to see a little more sense in this municipal discord. First of all, let’s map the mystery. Jonathan cycles down the rue de l'Aqueduc in the 10th arrondissement, using the bridge of the same name to cross over the tracks of the Gare de l’Est. Looking across to the south, Jonathan sees the white concrete diamonds of the pont La Fayette. The strange street, simple church and forgotten statue lay just to the north. The topography of the area combines traces of a medieval city footprint, 19th century road building and the kinds of municipal structures that were often placed on the city limits (schools, hospitals, military barracks), but it was the digging out of the gare de l’Est railway lines that did most to define the way it appears today. The truncated street, the rue Philippe de Girard, is a result of this, with a section of this ancient road being hacked off in place of the railway lines. 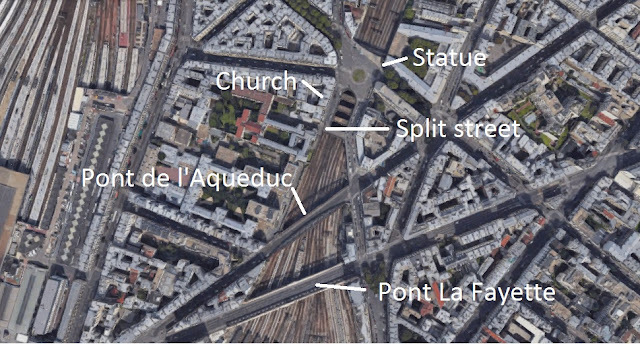 The church, Notre Dame d’Egypte, is on one fork of the street, standing anonymously beside the railway lines. Erected in 1903 and originally known as Notre Dame des Malades, the church is a curiosity inside, being shared by the traditional Catholic and Coptic Catholic communities. Statues exist alongside iconography in apparent harmony. Outside is a statue of another kind, a representation of a mythological faun surrounded by children. Created by the sculptor Yvonne Serruys and presented at the salon des beaux-arts in 1911, it seems to have been forgotten here in a scruffy little garden above the rumbling trains. 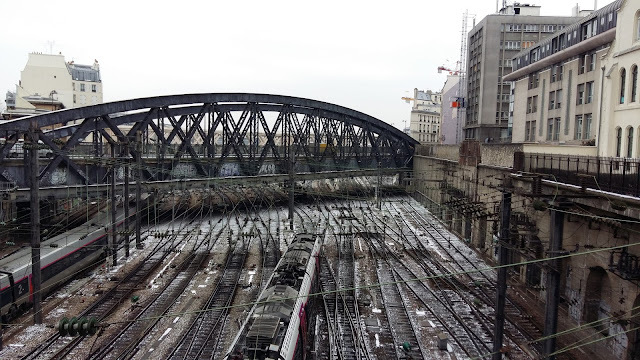 Moving on to the bridges, what it can be stated is that both routes – the rue La Fayette and the rue d’Aqueduc – predate the construction of the Gare de l’Est. The rue La Fayette is Jonathan’s traffic jam blocked thoroughfare, an artery of nearly 3km that leads into the heart of the city, so it is entirely logical that a bridge should have been built here. The bridge we see today though was not the original structure. In the first quarter of the twentieth century, the number of railway tracks doubled, which meant that the original bridge had to be replaced. Today’s 150m long concrete bridge was built, although part of it had to be lifted again in 1961 when the railway network was electrified. 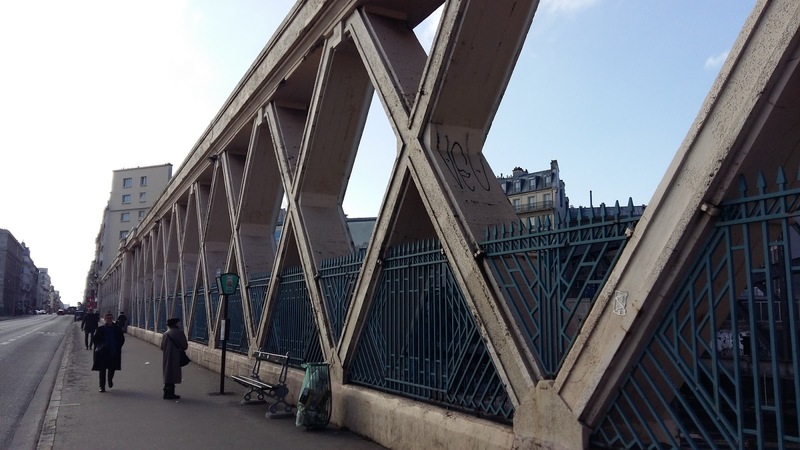 The question of necessity is more relevant for Jonathan’s empty bridge on the rue de l'Aqueduc. 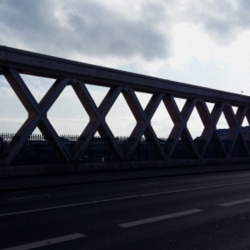 Why keep this secluded bridge, especially after the city authorities built a new bridge on the rue La Fayette? The answer can be found partly in the fact that the tracks pinch in more narrowly here, meaning that the bridge did not need to be altered, and partly in the name of the street. In fact, the viaduct is – as the name suggests – also a form of aqueduct! Beneath the rue de l'Aqueduc are large pipes carrying water from the canal de l'Ourcq to the centre of the city, the continuity of a project that originated with Napoleon Bonaparte and was put in place in 1825. It is only possible to guess at this infrastructure today, but look more closely and you will notice the large space between the road and the bottom of the bridge. If the pont de l'Aqueduc has little justification as a structure for car traffic today, it does still play a very important role in the life of the city, and not just as a quiet, picturesque path for cyclicsts! 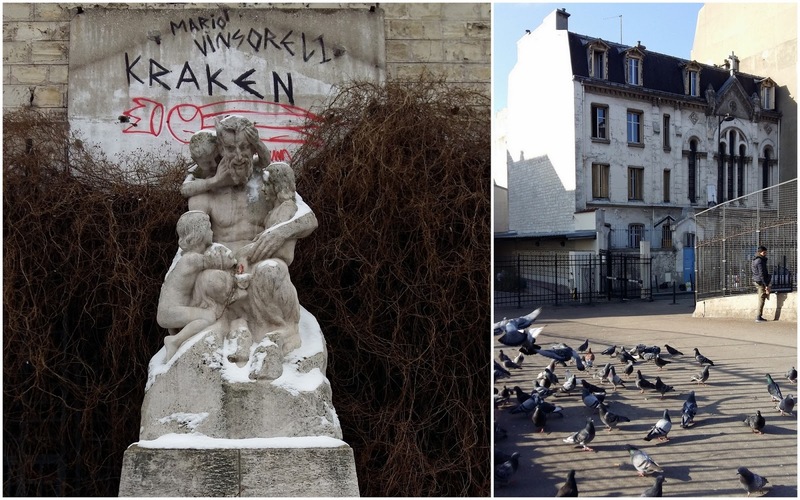 Before leaving this part of Paris, another landmark of strangeness should be mentioned. Water runs under the rue de l'Aqueduc, but energy of another form quite possibly flows in a building at number 51 on the street. "Le "Paranormal", nous n'y croyons pas. Nous l'étudions" (we don't believe in the paranormal, we study it) declares the website of the Institut Métapsychique International which was created in 1919. 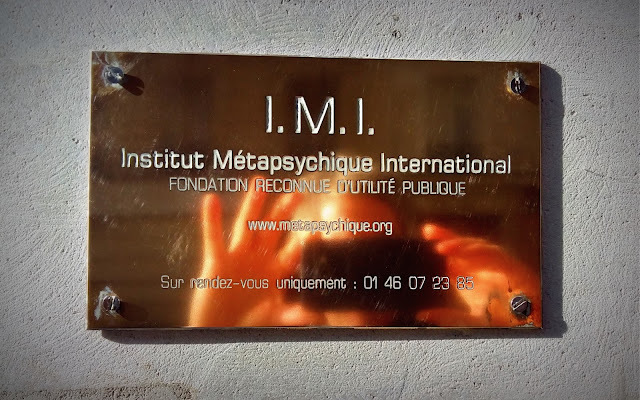 Recognised as being of public utility by the French state, the institute still today discreetly investigates and researches telepathy, mind reading and other paranormal phenomena. It is difficult to imagine such activities taking place behind the extremely banal exterior of the building, but then again it is difficult to imagine gallons of water flowing under our feet here too! An interesting post, Adam. Do you know the story behind that bizarre statue you have included a photo of? Is that Pan or Satan, surrounded by naked very young children? I've always found it singularly creepy.